Active transport and a safe way to escape! Just imagine escaping from suburbia, being able to easily walk or ride your bike to an off-road trail through treed corridors in natural bushland settings. Not too difficult for some, especially those who live within Bendigo and surrounding suburbs like Strathdale, Strathfieldsaye or Junortoun! Yet being able to safely connect with the likes of the O’Keefe Rail Trail, Sheepwash Creek Trail, Bendigo Creek Trail can often be taken for granted, perhaps due to previous formal urban planning or lobbying by the community. The latest linking path to the O’Keefe Rail Trail in Junortoun, through a new urban subdivision off Trotting Tce, is nearing completion (at the time of this post, the subdivision is still a ‘no go’ construction zone). Although this linking path, which will provide a safe route for families and individuals, was not ‘automatically’ including in the plan of subdivision by the private developer. 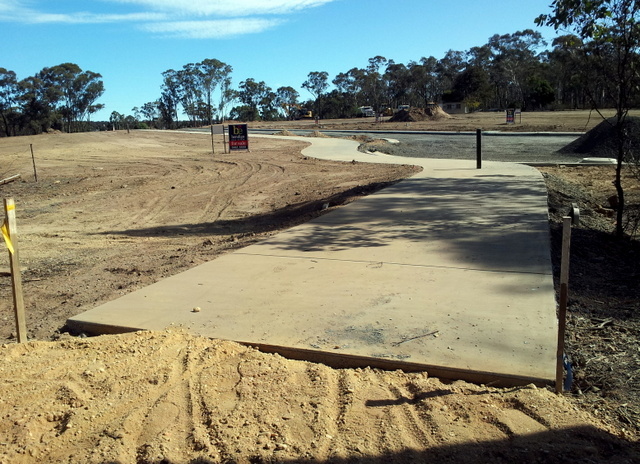 Nor did the City of Greater Bendigo’s planning scheme for this area ‘automatically’ require the developer to provide a new section to an overall network of off-road trails and pathways. Such overlay planning for a path-trail network does not appear to formally exist! A formal objection, lodged against the Trotting Tce developer’s 2013 application for a planning permit, was made by Friends of the Bendigo-Kilmore Rail Trail on behalf of the community. One of the objections was the lack of a formal link from Trotting Tce through the new estate to the adjoining rail trail, a link that would enhance the developing network of connecting trails and paths within the Greater Bendigo area. A positive outcome of this formal objection process was achieved, with the inclusion of a 2.5m concrete linking path through the subdivision. This path is expected to assist areas of Junortoun, Strathdale and Strathfieldsaye connect, via current or developing pathways, to the O’Keefe Rail Trail. Locally, the rail trail gives access to areas such as White Hills, North Bendigo, the Bendigo Creek Trail, the Bendigo Bushland Trail, schools and work places etc, as well as to Longlea, Axedale and Heathcote. The next challenge is to have a linking path from this subdivision’s path, along Trotting Tce to the One Tree Hill Forest’s asphalt surfaced trail (to Strathdale)! This short linking path needs to be a priority of Council. A new linking path to assist provide safe recreation activity and active transport use. Achieved by community intervention, assisted by Council and built by the land developer, this will provide options for all future generations!